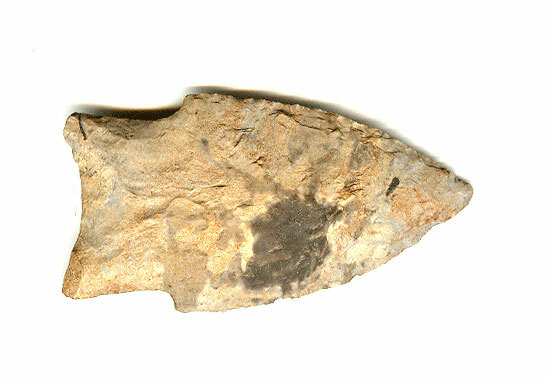 A Large Size, Colorful, Visibly Aged And Anciently Used, Well Made Johnson Point That Exhibits Surface Oxidation Aging & Stone Coloration Aging Patination, Aged Mineral Deposits, Correct Rolled Basal Stem Edge Hafting Dulling, Correct Blade Sharpening Use Reduction, Correct Material & Manufacture For The Area Found. Found By Jeff Christian Near The Buffalo River North Of Ponca, Arkansas. The Tom's Brook Shelter, In Johnson County, Located A Few Miles South Is The Type Site. Includes Dwain Rogers And Ken Partain Certificates of Authenticity!